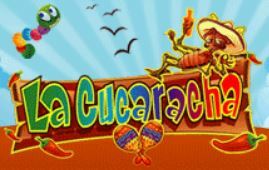 La Cucaracha is a very cool Mexican theme video slot by NextGen. In this game, you’re invited to taste chili peppers to win multipliers up to 100x! Not to mention, that you can also activate Free Spins and play a gamble your winnings mini-game to add even more excitement. ¡Ay, Caramba! So, if you like video slot with a unique Theme and huge multipliers, there’s a good chance you’ll enjoy La Cucaracha video slot. All and all, this game provides fantastic winning opportunities because the paytable is very high! Ready to learn a bit more about this one of a kind slot? Then read what’s next! How to trigger the bonus features of La Cucaracha video slot? In short, if you play La Cucaracha, you’ll have the chance to trigger 3 mini-games, or bonus feature if you prefer. The first one is the Chili tasting bonus, and you’ll trigger this bonus when 3 Chilli symbols land on Reel 2, 3 and 4 at the same time. In essence, this symbol combination will open the door to the Mexican fiesta, and you’ll try Chilli to see the Chilli-OW-Meter climb. Once the doors are open, pick one of the 4 stand displayed on your screen. And start the tasting session. In this game the hotter the chilly, the bigger multiplier you’ll win. To sum up, you’ll activate 10 Free rounds with a 2x multiplier when 3 guitar playing Cucaracha symbols land in view. Plus, you can re-trigger an infinite number of free spins with 3 or more scatter symbols. Check the paytable to know a bit more about this bonus feature. The last special feature of this game is the gamble your winnings mini-game. In short, you can activate this feature after any winning spins, and it’ll help you double-up and even quadruple-up winnings of any sizes. That is if you predict correctly the color or suit of a hidden card. Why should you play La Cucaracha video slot? La Cucaracha is a Festive and fun video slot, and you shouldn’t let the cockroach freak you out. Because the size of multipliers offered in this game is simply mind-blowing! Start the fiesta at Golden Nugget Casino listed on this page with a casino bonus and may all your chili be spicy as hell! Have fun!